You worked hard to get your license, don't give up so quick! You could opt in to the referral only program and bypass the fees. You can partner with an active agent and receive referral checks anywhere around the world! It's a great option you should consider before you give up. Contact me for more details. Check this video out! Misconception #1: It's an easy job. It is a very rewarding career. It's a career that's challenging in some wonderful ways. It's a career in which you have the potential to define and achieve your own success. But it isn't easy. We work hard to earn a license and to stay current on the laws that regulate our industry. We spend time building our reputations and relationships, so that we can have long-lasting careers. I tell the aspiring agents I work with that I use the word "career" and don't use the word "job" deliberately. At my brokerage, agents are essentially building businesses within the company. We set our own goals and make plans for reaching them. As our business grows we can hire our own support staff, transaction coordinators, and listing agents. So, it's definitely not a 9-5 job. But I think that's a good thing! Misconception #2: It's a cutthroat business and agents will do anything for a sale. Oh my goodness, does this one bother me! I feel like the agents I work with and have gotten to know over the years are some of the most supportive and encouraging people I've ever met AND incredibly generous with their time and knowledge. Keller Williams really fosters this culture with our new agent coaching program, but there are specific examples that spring to mind. I work with an agent who has the corner on a particularly large market here in the Northwest. When new agents come on staff, he'll let them work his (many) open houses, so that they have the chance to meet prospective clients and gain valuable face-to-face marketing experience. Are there unethical real estate agents? Sure. There are dishonest and unethical people in every profession. But the vast majority of us are honest and ethical and abide by a strict set of rules. Misconception #3: It's expensive to get started. It does cost some money for licensing, that's definitely true. But it's a far, far smaller financial investment than say, a 4-year college degree. The cost varies by state, so I can't give you a number that will be accurate. I guess my point would be, don't assume it's financially out of reach. You can easily research the costs in your area. If there's a brokerage you think you might want to work for once you're licensed, they can help you figure out what you need to budget for study materials, licensing exams and other fees. Misconception #4: If I'm not a natural sales person, I won't be successful. I would say that you have to be a good communicator and a good teacher, but not necessarily a "sales person," by the traditional definition. You do need the ability to talk to people; to connect with them; to hear what their needs are and gauge whether your particular skills and expertise are a good fit for them. And then you need the ability to communicate who you are and what you offer in a genuine way. Lots of successful agents don't have a "sales" background. I think I may have said this before on the blog, but I find that teachers, baristas and bartenders are common backgrounds for real estate agents. It's something about the patience, communication skills, service mindset and attention to detail, that makes them successful. I think. Misconception #5: Real estate careers are a good side gig/part-time job. I've done a blog post dedicated to just this topic, but I'll give you the shortened version here and then you can go back and read that post by clicking this link. I think it's impossible to stay up on all of the laws, regulations and details required to represent clients well if you aren't in it full-time. There are just too many moving pieces and the consequences of missing something are too grave to part-time this career. So if you find yourself in a position where you have to straddle the fence of 2 careers at 1 time, you would benefit from joining a team so that you can have the support you need to stay on it and your clients receive the best care possible. 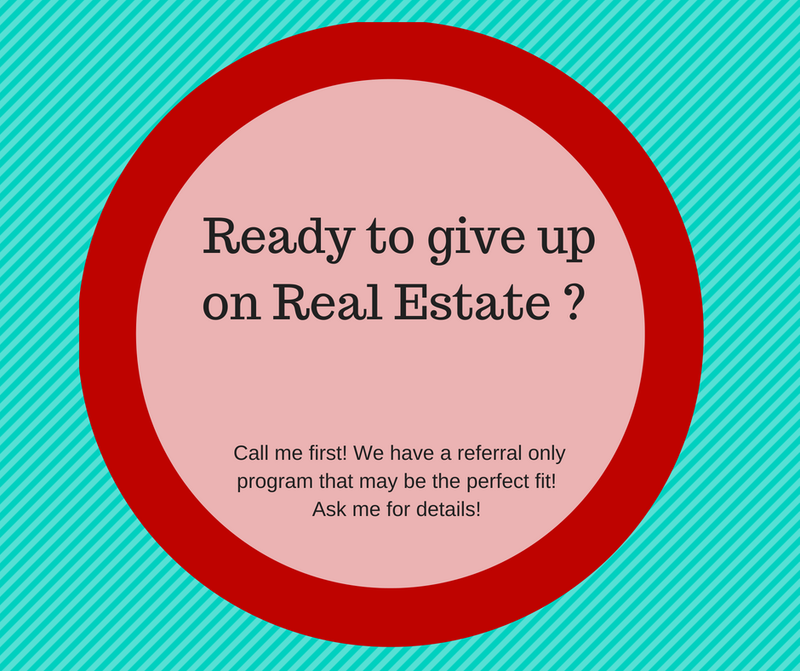 Or let's talk about referrals.... This is a great option for people who can't be 100% dedicated to the business. Ask me and we can go over the details together. Thanks again for reading! Check out my Rebecca Math video here. I'll be back here with a new post again soon!